One of the top position groups in this year’s draft is the defensive interior group, as there are at least four likely (and worthy) first-round picks in the class. This is great news for the NFL, as numerous teams have significant holes to fill inside. Here is a look at the top five interior prospects, and some of the top fits for each player. Ndamukong Suh cancelled a scheduled visit to Oakland, putting the Raiders back on the market for an elite interior defender. They didn’t have an interior defender with a pass-rush grade better than 75.6 last season and Hurst led the FBS with a 92.8 pass-rush grade and a 96.5 overall grade in 2017. David Irving had a solid 2017 in terms of rushing the passer with 30 total pressures on 228 rushes, but he and the rest of the defensive interior group in Dallas did not perform well against the run. Irving is likely back this year, as the Cowboys placed a second-round tender on him during free agency’s first week, but the roster still needs an inside force capable of producing on all downs. Despite Hurst’s play at Michigan being that of an elite prospect, he could still be on the board when Dallas picks at No. 19 due to concerns about his heart condition discovered at last month’s combine. He has since been medically cleared for his pro day, and he has the explosiveness off the snap and non-stop motor to not just get after the passer (he led all defensive tackles in FBS last year with 52 total pressures), but also defend the run at an elite level as well (he finished 13th in run-stop percentage). Defensive interior is one of the most critical needs on the Lions’ roster, even after the signing of Sylvester Williams and further speculation they may not be done shopping for veterans. 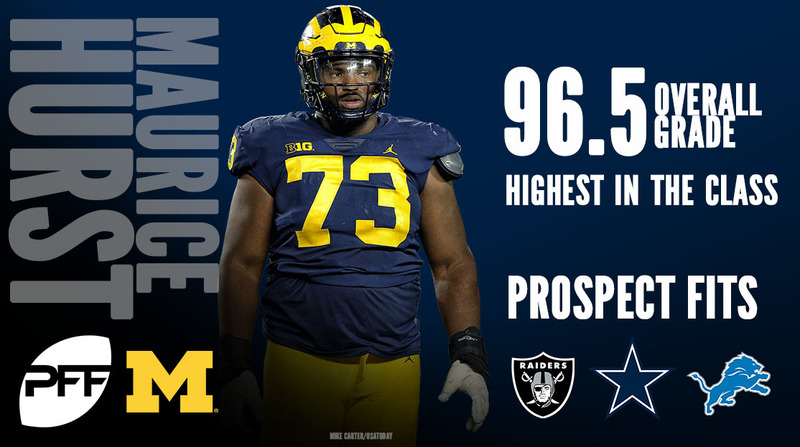 The options currently available to Detroit – both on the actual roster and available in free agency – can’t come close to competing with the pass-rush potential of Hurst. He finished 2017 ranked third among FBS interior rushers with eight sacks and first in hits with 13, helping him rank first in pass-rush productivity. With Suh’s release last week, the Dolphins lose the second-highest graded interior run defender in the league from 2017 (92.4). Vea ranked fourth at the position in this draft class in run-stop percentage (12.1) and his 92.0 run-defense grade was third-best in the class. As a rookie, Jonathan Allen showed the flashes that made him our top-rated defensive prospect from last year’s draft class, and as long as he maintains his health, he should be a significant force on the pass-rush for the Redskins. However, the roster lacks a natural nose tackle or 1-tech, thus making the position a big priority in this draft. Vea is certainly the top prospect at that position in this draft and his 44 total pressures last season demonstrate that he is an every-down player worthy of Washington’s No. 13 overall pick. With Brandon Mebane past the prime of his career (just six pressures and 10 total defensive stops last year), the Chargers need some beef inside to better-compliment the dynamic edge duo of Melvin Ingram and Joey Bosa. Vea’s 93.2 overall grade in 2017 ranked second in the draft class behind Hurst, bolstered by the aforementioned pass-rush productivity (which earned him an 87.6 grade in the discipline). Defensive interior is clearly a key target for the Titans, as they are currently among several teams vying for the services of Suh. Payne possesses an excellent combination of toughness and athleticism, making him the perfect versatile piece for the Titans’ front. Payne posted the same number of combined sacks and hits as Vea last year (13), and also had more solo (40) and total tackles (52) than both Hurst and Vea. While the defensive front of the Colts was one of the better run-defense groups in the league in 2017, no defensive lineman posted more than three sacks or seven combined sacks and hits. Payne was every bit as good on the pass-rush last season as he was in the run game, as he posted a near-elite 84.6 pass-rush grade. The Jets cut Muhammad Wilkerson this offseason due in large part to his sharp decline in productivity (he posted just 19 combined sacks and hits the past two seasons after putting up 35 in 2015), and they should once again be looking for inside help. Payne should be able to help immediately, not just on passing downs, but also against the run. He posted 21 run stops for Alabama last year and his 86.1 run-defense grade ranked 13th in the country. Malcom Brown was New England’s highest-graded defensive interior player for the Patriots last year and his 70.0 pass-rush grade ranked just 64th in the league. The Patriots will love Bryan’s versatility as a rusher as he also created pressure outside on one out of every 20.9 snaps, seventh-best in the class, and was very effective on stunts. The Browns will certainly be looking for 2017 draft picks Larry Ogunjobi and Caleb Brantley to play significantly larger roles in 2018 (the two combined for just 517 total snaps and 18 quarterback pressures), but with such a surplus of picks they’d do well to add another talent capable of getting after the quarterback. His 84.4 pass-rush grade ranked among the best of the draft class’ interior players. The Broncos have failed to replace the inside pass-rush production of Malik Jackson, who left via free agency in 2016 and has in the two years since posted a total of 17 sacks and 18 hits for the Jaguars. 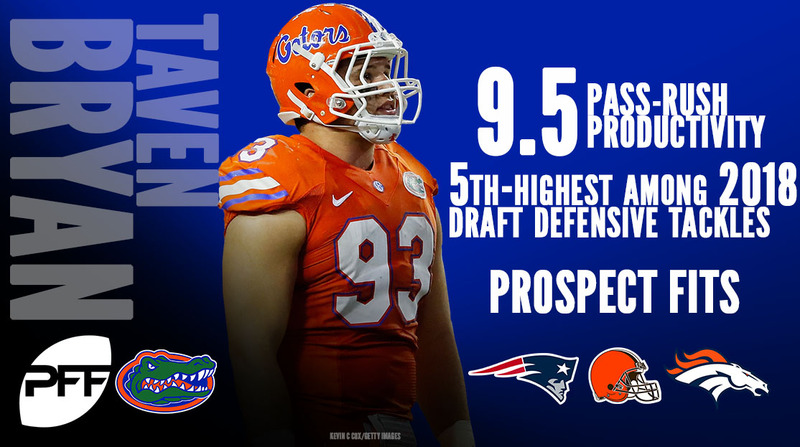 Bryan notched at least three pressures in four of the eleven games he played for Florida last year, while all of Denver’s interior defenders combined for just four over the entire NFL season. The Rams’ interest in a defensive tackle is largely contingent on where Suh goes, as they were his last visit and could be the leader in the clubhouse at this point. If they don’t land the superstar free agent, Phillips would provide a huge boost to a run defense that struggled significantly at times last year. Phillips led all interior defenders last year in run stops and was second with a run-stop percentage of 13.2. The Falcons lost Dontari Poe in free agency and need to replace his 40 total pressures and 28 defensive stops from last year. Phillips offered some production on the pass-rush last year with 38 total pressures for the Cardinal, but it was his 90.9 run-defense grade, fourth-best in the country, that helped him to our No. 5 ranking among interior defenders prospects this year. Phillips earned a 90.5 overall grade last season, fifth-best among defensive interior players in FBS. His lack of development in terms of pass-rush skills could be a concern for some, but the Jaguars are already getting outstanding production in that area, and they will be more focused on improving the run defense. Midseason pickup Marcell Dareus finished the season ranked 12th among defensive tackles in run-stop percentage, but none of Jacksonville’s other interior defenders ranked in the top 40.